“At a time of unprecedented political turmoil, Jeff Sessions has come to California to further divide and polarize America. “This is really unprecedented for the chief law enforcement officer of the United States to come out to California and act more like Fox News than a law enforcement officer. This is a political stunt,” Brown said. As The Hill reports, Brown said Sessions’s speech was “unbecoming” of the nation’s chief law enforcement officer. He speculated that Sessions is trying to return to President Trump’s good graces, after a rocky first year in which Trump and Sessions saw a serious rift in their once-close relationship. “I assume, and this is pure speculation, that Jeff thinks that Donald will be happy with him,” Brown said. Appearing with Brown, California Attorney General Xavier Becerra (D) said his office would mount a spirited defense of the three state laws. Becerra said the lawsuit would fail. “The lawsuit challenges some of our state laws which are again fully constitutional and provide for the safety and welfare of all of our people,” Becerra said. Becerra said the Trump administration had opened itself to the discovery process, which would allow California lawyers to dig into the internal debate over the lawsuit, which could drag on for years. 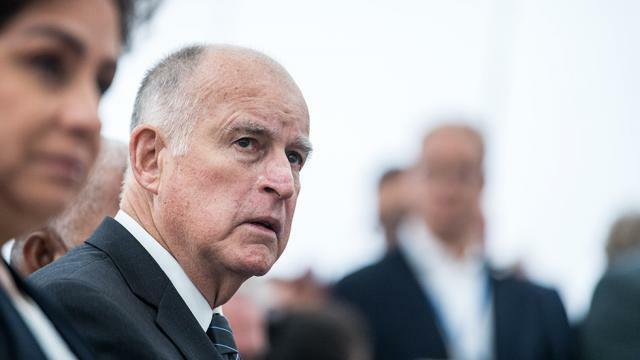 “This lawsuit is going to last a lot longer than the Trump administration,” Brown predicted.